She sits alone in a dark room, hiding behind a shroud of secrets. She finally pulls back the veil and the truth is revealled to Sherlock Holmes. 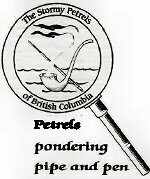 The next meeting of The Stormy Petrels will take place on Tuesday, Novembeer 2 at 7:00 pm chez Wood.